I'm bringing you another 'just because' card that I made weeks ago. 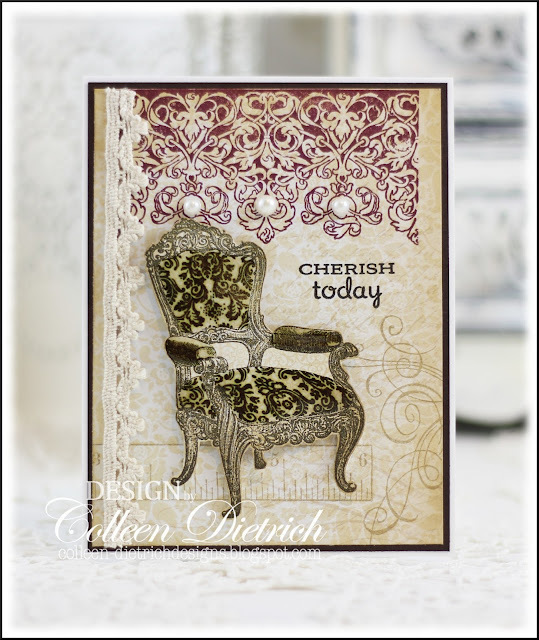 I LOVE this Damask Chair set by Stampendous, which is new to me (at a discount from Michael's; even better!). Adding some Glossy Accents to the fabric portions of the chair made them really pop. It reminds me of vinyl coverings on upholstered seating. I've never been a fan of that practice, but to each his own! Awesome, awesome, awesome! What a wonderful card. The chair has such depth, it looks as if it's coming off the card and inviting you to plop right down in it. Wowwwwwwwwww! this is gorgeous!! LOVING that chair!!! Oh la la! So elegant and rich! Looks like a chair a queen would sit in! Love the dimension you gave to highlight the chair! Awesome card...love it! That's one swanky chair Colleen, your fabric looks great! I can't wait for the photo tour of your new studio!! This is soooooo charming. Clever touch with the glossy accents. Love it! Der elegante Stuhl sieht aus, wie mit feinstem Stoff bezogen. Awesome card ! 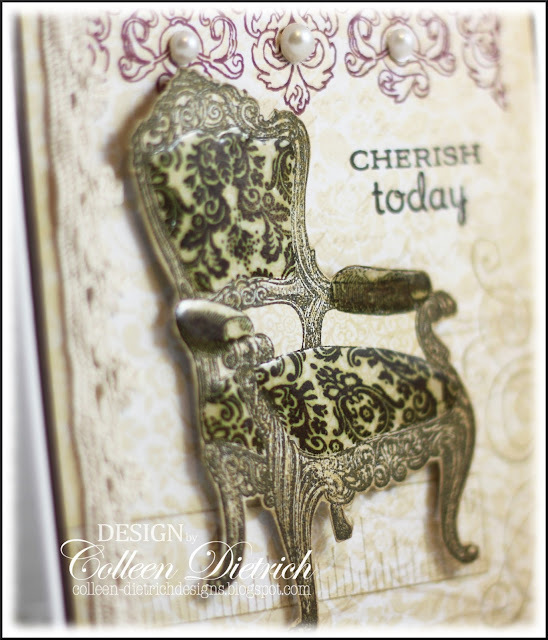 Has a vintage feel and loved the chair looks like real fabric. Wow Colleen - this looks so realistic and gorgeous! I'm forever impressed by your ideas and creativity! Hugz! I've been out of state for several days and I see you have uploaded quite a bit I love this elegant card. Wow! I'm making my way to your craft room photos. Can't wait to see them. Very pretty! Love that chair and it "vinyl" covering! What a cute stamp! Beautiful upholstery job. Love how perfectly coordinated your design and image are.